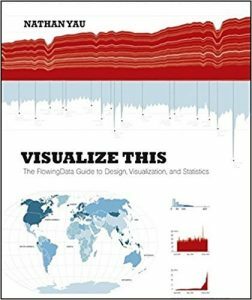 Nathan Yau in his Visualize This book offers step-by-step tutorials and practical design tips for creating statistical graphics and information design to find meaning in the numbers. Nathan emphasizes the data-first approach teaching you how to explore what your data has to say first, and you can design graphics that mean something. The book introduces several interesting stepping stones of the process of storytelling your data more effectively to audience. Think of all the popular data visualization works out there—they all tell an interesting story. Maybe the story was to convince you of something. Maybe it was to compel you to action, enlighten you with new information, or force you to question your own preconceived notions of reality. Whatever it is, the best data visualization, big or small, for art or a slide presentation, helps you see what the data have to say. Data can be boring if you don’t know what you’re looking for or don’t know that there’s something to look for in the first place. It’s just a mix of numbers and words that mean nothing other than their raw values. The great thing about statistics and visualization is that they help you look beyond that. It’s not just about the data that makes for interesting chatter. It’s how you present it and design it that can help people remember. When it’s all said and done, here’s what you need to know. Approach visualization as if you were telling a story. What kind of story are you trying to tell? Is it a report, or is it a novel? Do you want to convince people that action is necessary? In short, start with a question, investigate your data with a critical eye, and figure out the purpose of your graphics and who they’re for. This will help you design a clear graphic that’s worth people’s time—no matter what kind of graphic it is. Before you start working on the visual part of any visualization, you actually need data. The data is what makes a visualization interesting. If you don’t have interesting data, you just end up with a forgettable graph or a pretty but useless picture. You also need to check for context. You don’t need to become an expert in the data’s subject matter, but you should know where the original data came from, how it was collected, and what it’s about. This can help you build a better graphic and tell a complete story when you design your graphic. A data graphic is only as interesting as its underlying data. You can dress up a graphic all you want, but the data (or the results from your analysis of the data) is still the substance. When you start, it’s easy to get excited about your end result. You want something amazing, beautiful, and interesting to look at, and this is great; but you can’t do any of that if you have no idea what you’re visualizing. Don’t assume your readers know everything or that they can spot features in your graphic. This is especially true with the web because people are used to clicking on the next thing. That’s not to say that people won’t spend time looking at data. At its most basic level, visualization is turning data, which can be numbers, text, categories, or any variety of things, into visual elements. Some visual cues work better than others, but applicability also varies by dataset. Consider the audience, the data in front of you, and ask yourself whether the final graphic makes sense. Does it tell you what you want to know? If yes, then great. If no, go back to the drawing board and figure out what would make the graphic better so that it answers the questions you have about the data. Ultimately, it’s all about your goals for the graphic, what story you want to tell, and who you tell it to. Take all of the above into account—and you’re golden. At the core of all your favorite data graphics is a data type and a visualization method that you now know how to work with. You can build on these for more advanced and complex graphics. Add interactions, combine plots, or complement your graphics with photographs and words to add more context. Remember: Data is simply a representation of real life. Statistics is about storytelling with data. You get a bunch of data, which represents the physical world, and then you analyze that data to find not just correlations, but also what’s going on around you. These stories can then help you solve real-world problems, such as decreasing crime, improving healthcare, and moving traffic on the freeway, or it can simply help you stay more informed. A lot of people don’t make that connection between data and real life. You don’t have to be a graphic designer to make great graphics. You don’t need a statistics PhD either. You just need to be eager to learn, and like almost everything in life, you have to practice to get better. Grab a copy of Visualize This book.